In this collaboration between artist Kate Endle and “kindie rockstar” Caspar Babypants, a young girl’s fascination with animals in nature is captured in captivating, colorful spreads and a gentle sing-song text. The artist’s signature cut-paper collages are full of detail and based on one of Kate Endle’s enduring memories from her own childhood in which she wished she could commune with the birds, frogs, rabbits, and butterflies that she encountered. Readers are invited to share that sense of wonder and love for the animal world in this captivating book. Free MP3 download of the song based on the text of Woodland Wish performed by Caspar Babypants! 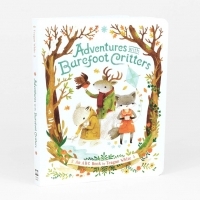 Teagan White "Adventures with Barefoot Critters Board Book"